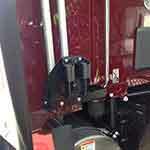 There are several reasons a driver will need to uncouple from a trailer. Following the proper steps for uncoupling will protect the trailer and truck from preventable damage and keep you safe. Before uncoupling ensure trailer is on level ground that will support the weight of the trailer. Look for and avoid potholes, large cracks, or soft ground. Uncoupling on an uneven surface can damage the landing gear, 5th wheel, and/or trailer. 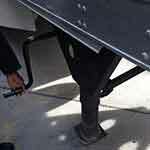 Once you are satisfied with the surface under the trailer, start the uncoupling process by lowering the landing gear. Lowering the landing gear is similar to raising it. Unhook the crank handle from under the trailer and turn the crank until the landing gear touches the ground. Once the landing gear is down, move to the other side of the truck to unhook the electrical and air lines. 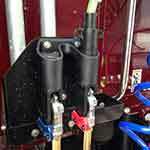 Each truck has couplers for the emergency brake air line (red) and service brake air line (blue). For the electrical line (green) there’s a plug. To release the air lines from the trailer, one at a time, grab the air line by the glad hand and push upward until it is at a 90° angle with the coupler. This will allow you to remove the air lines from the trailer. Hook the a ir line on the tractor’s coupler. For the electrical line, grab the plug and pull out of the trailer’s socket. Place the plug in the coupler on the back of the truck. This socket is facing downward to ensure water does not get into the electrical line. 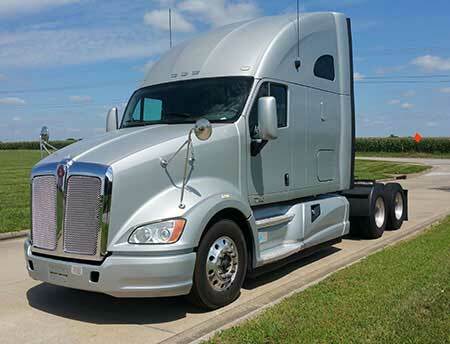 By properly securing the air and electrical lines to their couplers on the back of the truck, you reduce the chance of water and other debris getting into the lines. 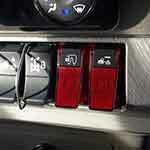 Our trucks are equipped with a kingpin release switch. Lift the red protector to lift the switch. 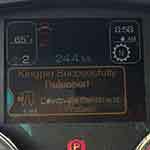 The dashboard display will tell you when the kingpin is successfully release. Put the switch’s red protector back down over the switch. Once the kingpin is released, lower the truck’s suspension by deflating the truck’s airbags. This will lower the truck away from the trailer. At this point, the trailer’s weight should be held completely by the landing gear. Slowing move the truck forward and out from under the trailer. Once the truck is clear of the trailer, inflate the airbags until the truck is back to its original height. Now you are able to continue on your way, trailer free.